1) If Suresh borrows Rs. 36000 from Mahesh at rate of interest 6% S.I, at the end of four years how much interest Suresh has to pay along with principal amount? 2) If A lends Rs. 4500 to B at 8% per annum and B lends the same sum to C at 10% per annum, find the gain of B in a period of 3 years. The gain of B will be equal to the difference between the interest which C pays to D and the interest which B pays to A for the amount borrowed. 3) In how many years the simple interest on Rs. 6000 at 10% rate of interest S.I will become Rs. 1800? 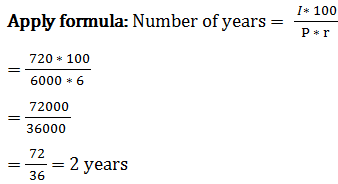 Number of years or time =? 4) Sohan has borrowed Rs. 5000 at the rate of 6% S.I. what amount he needs to pay after 3 years to clear the debt? 5) In what time Rs. 6000 will give interest of Rs. 720 at the rate of 6% p.a. S.I.? Time or number of years =?